So my girlfriend wanted the chance to see the Aurora (northern lights) and as it is her birthday on New Year’s eve we decided we should get away for New Year. 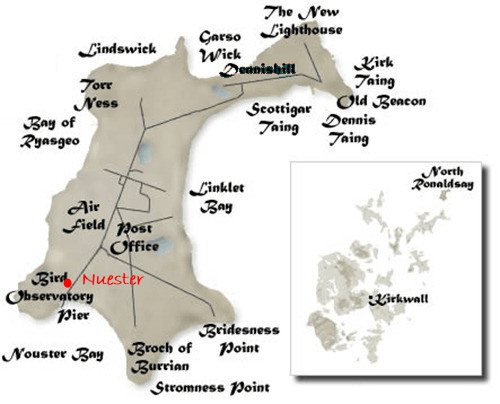 After a few searches, and shocks at the prices of going to places like Norway, Iceland or somewhere similarly that far north, we found a nice cottage called Nuester on North Ronaldsay which is the most north easterly island of the Orkney Isles. I was given permission to take a radio and have been active as MM1BXF/P over the New Year’s period. Thanks to Rob M0VFC for a loan of his Icom IC-7000, Thomas M0TRN for a loan of his Z11pro ATU and to Lawrence M0LCM for a loan of his BudPole vertical and mini switch-mode PSU. I actually used it to support a 40m dipole. The IOTA reference is EU-009, the WAB is HY75 and the locator IO89SI. As my home call is M1BXF I’ll need to get QSL cards printed for my MM1BXF call, and due to the rubbish organisation of the RSGB QSL BURO will no doubt need to argue I’m an RSGB member, then have my envelopes sent back from the sub manager, argue some more and eventually get the cards so I apologise in advance for any delay in BURO card responses. Please QSL via M1BXF.